On 26.09.2011, the Ghana Football Association published the squads for the GLO Premier League 2011-2012. In this post, I will make some comments about newly promoted side Wassaman United FC. It is very difficult to find information about Wassaman United FC and its players. Firstly, I am only able to find a handful of players that I know was part of the team that won promotion. Secondly, the club has been linked to a lot of new players during the summer. Some of these players have been high profile players. I will start by commenting on the players who has been officially registered according to the Ghana Football Association. Wassaman United FC has signed Stephen Aidoo, the former captain of Eleven Wise FC who played for Ebusua Dwarfs last season. Aidoo is a tough defender with a commanding physical presence. Perhaps not the fastest, he compensates with smartness. He has a great right-foot and is always willing to join the attack. Aidoo is a good acquisition for the newcomers. David Kotey, Paul Danso and Joseph Tetteh-Zutah will most likely be key midfielders. Kotey is a former player of Hearts of Oak SC and Sporting Mirren FC, while Danso was one of the players that contributed to the promotion of Wassaman United FC last season. 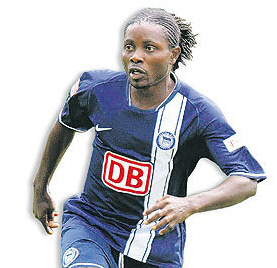 Danso is a former player of Medeama SC. Tetteh-Zutah is an interesting, 21 year old midfielder who was part of the Ghana team for the 2011 Summer Universiade, an International multi-sport event for university athletes. The other players listed by the Ghana Football Association are: Evans Quansah, Maxwell Dorsuh, Prince Boateng, John Kane Arhu, Daniel Asamoah, Kasim Seidu Musah, Christian Asiedu, Abdul Barey and Solomon Agbeve. “Prince Boateng” could be the former right-back of Asante Kotoko FC, born 01.08.1986, but this is just a theory. Besides the registered players, I know that left-winger Abdul Bashiru has joined Wassaman United FC from Hearts of Oak SC. This is a big surprise to me as the quick and skillful winger has an obvious potential and made some good performances for the Phobians last season. Bashiru will be the player to watch this season. The experienced midfielder Prince Antwi, formerly of AshantiGold SC and Hasaacas FC, is another interesting newcomer. Kweku Essien, who was relegated with BA Stars FC last season, will need to get his career back on track and Wassaman United FC could be the right club. The picture is of Essien from his days at Hertha BSC Berlin(Germany) and is taken from Ghanasoccernet. Left-back Emmanuel Eyison joins from Heart of Lions FC and will be a leader in defence. Wassaman United FC has been linked to several good players during the last couple of months, including the experienced journeyman striker Ishmael Addo (born 30.07.1982), marksman Edward Affum (born 20.05.1989) from Asante Kotoko FC, lanky striker John Antwi from Hearts of Oak SC, the versatile defender Philip Boampong (born 01.01.1990) from Hearts of Oak SC, playmaker Abdul Ganiyu Haruna (born 23.10.1987) from Asante Kotoko FC, goalkeeper Philemon McCarthy (born 14.08.1983) from Hearts of Oak SC, defensive midfielder Tetteh Nortey (born 20.11.1990) from Hearts of Oak SC and hard-working midfielder / winger Issah Salihu (born 28.09.1983) from Medeama SC. I am pretty sure that Salihu is a confirmed signing but this has to be confirmed. The other players mentioned are primarily rumors but I find it likely that some of the transfers have materialized. The more the better, as most of these players can be regarded as top shelf players in the GLO Premier League. I also have a theory that Kwaku Boamah (born 15.09.1992), formerly of Medeama SC and Berekum Arsenal FC, is a player at the club. According to Ghanasoccernet, Wassaman United FC used a goalkeeper called “Tetteh Boateng” in their first match of the season, last Sunday. When Wassaman United FC won promotion, the club used a few well-known players including striker Abubakar Mahadi (born 30.03.1985), formerly of the Feyenoord Academy, Hearts of Oak SC and Medeama SC and midfielder Jordan Owusu Mintah (born 02.10.1993), formerly of Kessben FC, and the experienced Ernest Okyere (born 20.09.1985). I am not sure if any of these players are still with the club. Evans Quansah, Maxwell Dorsuh, Prince Boateng, John Kane Arhu, Daniel Asamoah, Kasim Seidu Musah, Christian Asiedu, Abdul Barey and Solomon Agbeve. AM A FOOTBALLER HERE IN NIGERIA AND I WOULD LOVE TO BE PART OF YOUR FOOTBALL TEAM.